JP Graphics is a certified woman-owned business, and one of the first certified Green Businesses in Santa Clara, CA. Santa Clara city staff interviewed Joan Escover, President of JP Graphics. City Staff: Why did you decide to pursue the Green Business Certification? Escover: One, I am an avid recycler and I always have been. But really, I started out with the solar panels. I installed them because of the incentives. This program was a no brainer for me. Also, we do a lot of printing for the City of Milpitas, which requires 40% post-consumer recycled paper, so it was a logical thing to buy and start carrying it for everyone. All papers we use here at JP Graphics have minimum 10% recycled content, all the way up to 100%. City Staff: Was it an easy process to go through? Escover: Yes. I’ve been certified for about 6 or 7 years now. From what I remember, it went into everything from your faucets to your lightbulbs to what kind of car your employees are driving. So, I remember it feeling like a lot at first, but it was actually easy once I started checking things off. City Staff: What piece of advice would you give to an organization that is considering becoming Green Certified? Escover: First of all, I think anyone that owns the building that they’re in needs to install solar panels on the roof. If you’re not taking advantage of the available rebates, you’re really missing out on an opportunity. 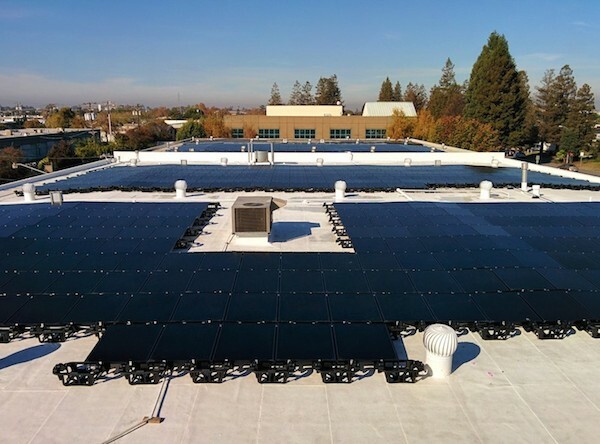 See the image above of the JP Graphics solar panels that provide the energy needs for our factory floor and offices in Santa Clara, CA. City Staff: What aspect of the certification was the easiest for you? Escover: Definitely the recycling of papers, but actually, the solar panels. During that economic downturn in ’08, I used every bit of knowledge I had just to stay in business. One of the things I did was put solar panels on this building, which was hard for my employees to understand give our financial situation, but in the end it helped us stay in business because of the rebates. City Staff: How much of your energy needs do your solar panels provide you? Escover: My bills were cut in half. On a summer’s day I would say we produce about 75% of our electricity needs with our solar panels. Since we don’t work weekends, it goes back to the grid, and then I get a check because I’m selling back that energy. Looking for a Green Printing Company? You’ve come to the right place. Contact us to get a price quote on your project! JP Graphics adds Horizon Creaser Folder to Expand Print Solutions We’re Proud to Print for the Warriors!